Tourists in Vietnam now talk about how the resort is recovering from Hurricane Damry. 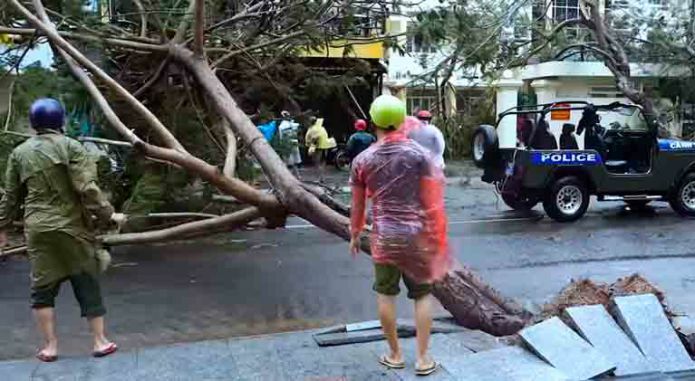 Thus, in the most affected city of Nha Trang, work is under way to clean streets and embankments from garbage, tourists write about it in social networks. According to the statement, confirmed by numerous photos and video frames, as a result of the disaster, hotels, cafes, restaurants, embankment and other infrastructure components suffered. "Tourists had problems with food, nothing worked. The light was not more than one day, in some areas the water was not yet turned on, the streets were covered with lying trees, many houses were left without roofs and windows, "writes one of the tourists on his social network page. According to the witness of the disaster, first of all the restoration of the most popular hotels is in progress. "If there is an opportunity to postpone the trip to Nha Trang, it is better to wait with her," he said. The weather in the resort has already normalized. "The water on the central beach is still muddy (because of the Kai river), but in the north and the islands everything is fine. Air temperature +30 degrees, water +25. A small breeze, the sun is shining, "- write on the page Forum_Vietnam in" Instagram ". At the same time, users of social networks say that at the moment it is possible to visit not all tours. The Vinperl Park and the pools in the Central Park are open to visitors, - noted on one of the Internet forums.